One thing I have never been a big fan of is fishing. It’s just not my thing. It requires patience and a very dull sense of smell, neither of which I possess. However, when faced with very limited choices for weekend activities, fishing is better than a poke in the eye with a sharp stick, as my daddy used to say. 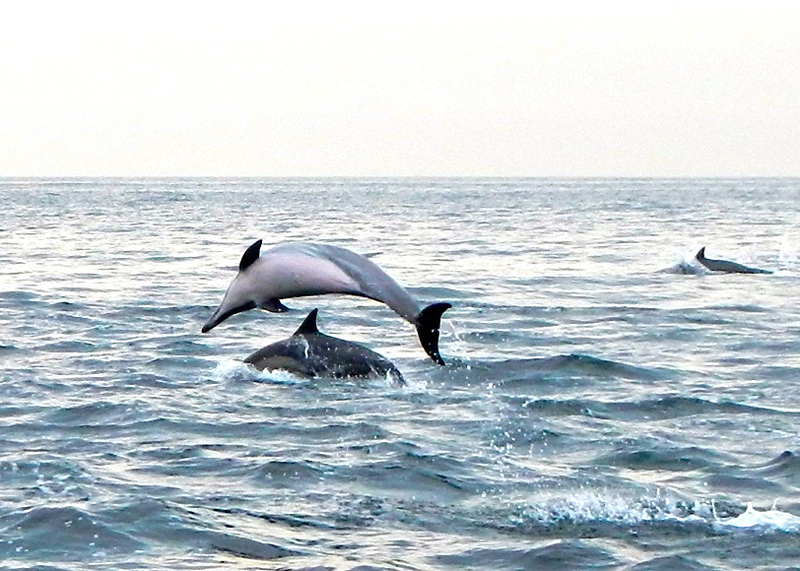 As mentioned in previous blogs, one of the perks of our posting here in Luanda is the use of the company boats for whale watching in the winter and fishing in the summer. We went on several amazing whale watching trips right after we arrived last September, but now those fabulously rotund mammals have left our local waters and so fishing is our only choice. I really enjoy riding in the boat, especially on a nice day, so when we were invited on two recent trips, I happily went along. Our first trip was at the invitation of a couple whom I will call Mr. & Mrs. G. They work for another company, and we met through mutual friends shortly after we moved here. Mr. & Mrs. G are the best kind of expats: gracious, friendly, and always up for an adventure. On the morning of our fishing trip, we planned to meet Mr. & Mrs. G at the Marina, located a few short miles away. We allowed ten minutes to get there, but had not counted on the infamous Luanda traffic. Eight o’clock on a Saturday morning should have been smooth sailing, right? Wrong. We have since learned that for every event in this city, streets are simply closed and no detours are provided. I can only assume people are expected to sit in their cars and just wait until the event is over! On this particular morning, there was a very small “fun run” which had brought the traffic to a complete standstill. After back-tracking and trying several different routes, we still ended up sitting in dead-stopped traffic, only marginally closer to our destination. Frustrated and late, we briefly considered walking the remaining two blocks to the marina, but thought better of it when our driver said it was not a safe area. A quick glance out of the car window confirmed his assessment. Finally, after more than forty-five minutes, the event ended and the traffic started to move. We arrived at the marina to find Mr. & Mrs. G waiting patiently. Another lovely couple had also joined them, and we boarded the boat with high hopes and visions of fish on the grill that night. It was a lovely day: slightly overcast, cool and only enough breeze to make it comfortable. We cruised around for several hours, in search of fish. I was perfectly happy just riding along, visiting with the ladies and munching on the yummy snacks Mrs. G had brought along. But, clearly the boys were getting restless. For some reason, the group had decided that I needed to reel in the first fish – if one ever decided to take the hook, of course. I knew it was bound to happen sooner or later, so I made myself ready by strapping on the fighting belt and preparing myself for the epic battle. 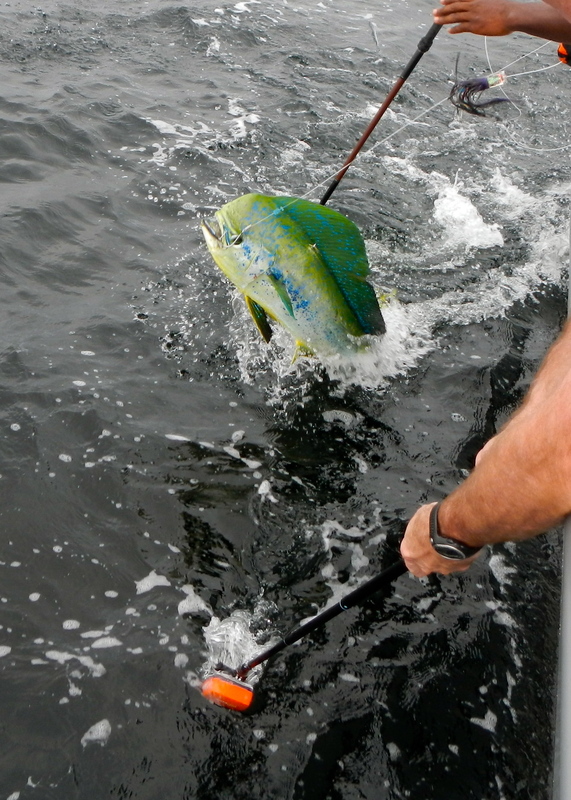 At last, a dorado (or mahi-mahi) went for the bait and I grabbed the fishing rod. Wow! I had no idea how weak I was! Clearly, I need to start lifting weights. If my difficulty in reeling him in was any indication, he was sure to be a whopper. Or she – who can tell? Sadly, he was no whopper, but he was a respectable size – at least big enough to keep. And best of all, I didn’t lose him. A tasty dorado. Mr. G is having fun getting some underwater footage with his GoPro, too. There. Job done. Now, back to solving the world’s problems with the ladies. Over the course of the next hour or so, a few more fish were caught by the guys on board. I’m not sure how the other two gals got out of fishing, but no matter. My catch meant that hubby and I ended up with some tasty fresh fish for dinner, and even some to share with our driver. All-in-all it was a fantastic day. My dorado. He looks a bit beat-up, but he sure tasted good! Our second fishing trip was at the invitation of Mr. & Mrs. Adventurous, another one of our favorite couples here. These two intrepid travelers are just back from climbing Mt. Kilimanjaro. Honestly, when I think of all they do, I feel like a slug. They are just the motivation I need to spend some extra time in the gym and take the stairs up to my tenth floor flat. The weather for this second trip was also very nice, a bit more overcast but nicely cool as a result. We met up with Mr. & Mrs. A in the parking lot of the marina. There was no traffic on this morning, thank goodness. Jesus, the driver for Mr. & Mrs. A, reminded them that his wife trades kisses for fishes, and he was counting on them to help a fella out. As far as we knew our driver was only looking forward to a tasty meal, should he be getting some fish from us! We headed out on our company boat, just the four of us. About an hour into the trip, we spotted some dolphins in the distance. As we drew nearer, it was clear that this was no ordinary pod. 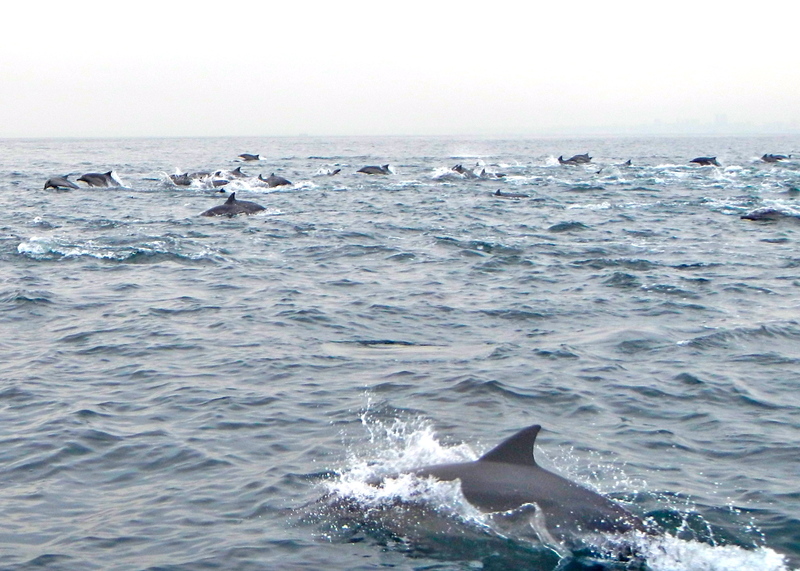 This group was made up of hundreds of dolphins, speeding along, jumping and playing. 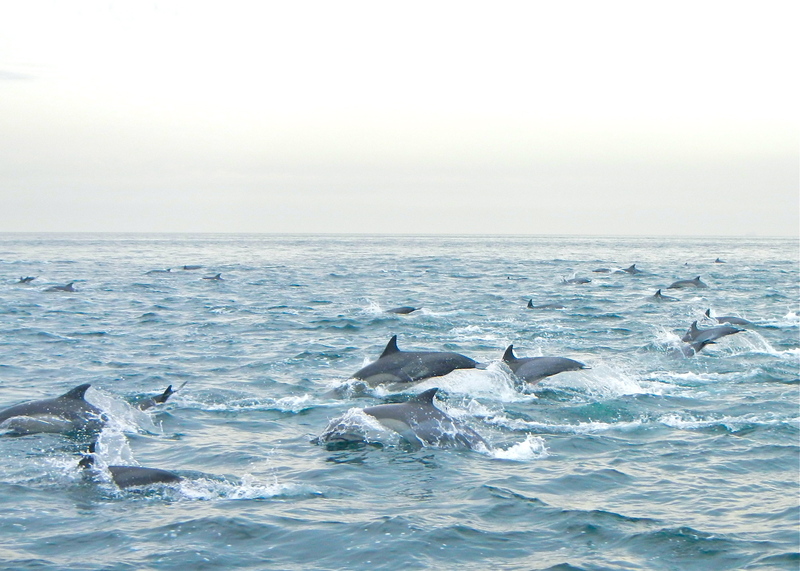 The captain maneuvered our boat right in the middle of the pod and matched our speed to the dolphins. 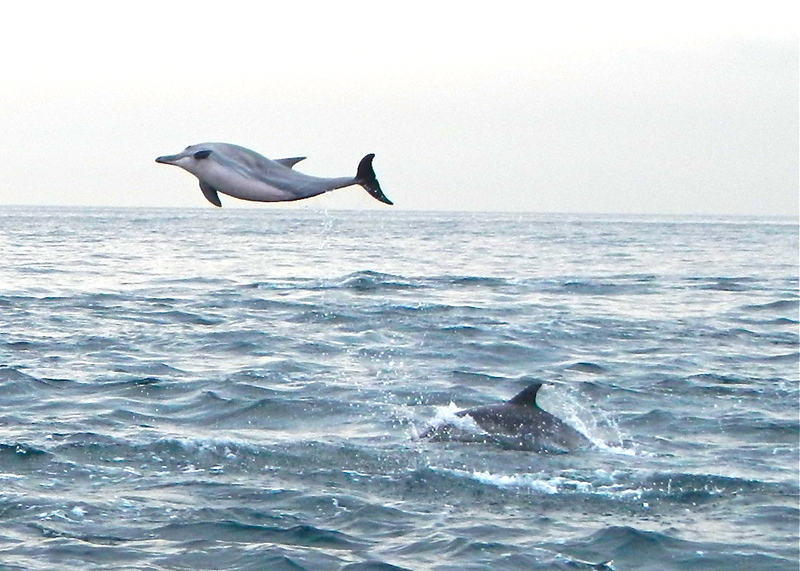 Mrs. Adventurous and I climbed onto the front of the boat to get a better view of this amazing sight. Honestly, I could have ridden alongside them for hours, it was so fun to watch them leap and slap the surface with their bellies as they landed. As we leaned over the bow, we could see them cruising along under the water within a foot of the hull, enjoying this game of chase. Many of the dolphins had pink bellies, which I later read is the result of very warm conditions, or even a general state of excitement. They certainly looked excited to me, leaping and launching themselves out of the water with a frenzy! We sailed along as part of the group for about twenty minutes, until the captain decided it was time to get back to the pursuit of fish we could actually catch. And so, we left our friends behind and turned the boat in search of some delicious dorado. We cruised around looking for the “weed line”, where an inflowing river runs into the predominant ocean current. Weeds – or trash, in Luanda’s case – collect in this confluence. In fact, in Luanda, so much trash collects that the weed line is very easy to spot, even from quite far away. Large wooden pallets, buckets, plastic bags, and flip-flops of every size and color bobbed along in the water. I have seen many barefooted people around here, and now I know where all of their shoes are! Theoretically, the weed line attracts bait fish, and they in turn attract bigger fish. This theory did not work for us, however, as we dragged our lines through that muck for hours and never had a single bite. We did hook a cute hot-pink bra though! And it looked to be about my size. Too bad it fell off the hook. As entertaining as it was to see what ended up floating miles offshore, after several hours we decided we’d had enough and headed back to the marina. On the way, we spotted several small fishing boats and moved closer to see what they were catching. The fishing gods were with those fellas, as we watched them toss fish after fish into their small boats. They had set out long stringers which were now loaded with Carapau, an oily fish similar to a mackerel. 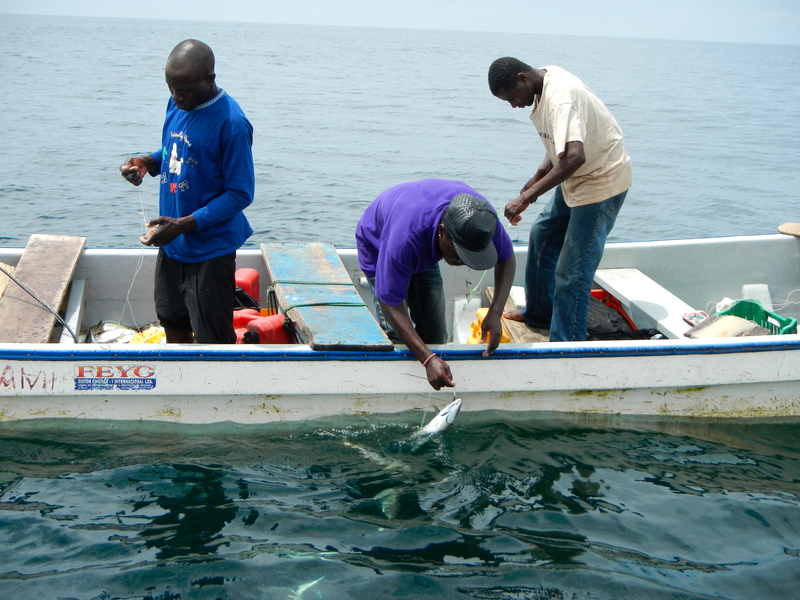 Our captain was very happy to learn that the fishermen would sell nine of these fish for only two-thousand kwanzas, the equivalent of about twenty dollars. He seemed puzzled that we were not interested in buying some as well. I’ll admit, I considered it – but only for a moment. Making a decent meal is a challenge for me on my best day, and using gourmet ingredients. Surely, anything I had made with those oily fish would have wound up in the trash bin. Though we didn’t wind up with any fish – and Jesus would not be getting any kisses – we will always remember the thrill of riding along with those dolphins. Maybe after these two experiences, I need to reevaluate my distaste for fishing. Of course, I know not every trip will be as fun as these two were. But as they say, a bad day fishing is better than a good day at the office…or in my case, a good day hunting and gathering through the mean streets of Luanda. How amazing! Dolphins are such beautiful animals. Glad you had fun fishing!